How long do you see the global central banks continue with their easy money policies? Marc Faber : Major central banks started with their easy money policies long ago. The first indication of money printing was essentially in 1998 with a bailout via the long-term capital management (LTCM). At that time, I don't think anything would have happened to the system. The central banks printed money massively and deliberately created the NASDAQ bubble. When this bubble burst, they deliberately created the housing bubble that was built on excessive credit growth. And when this bubble burst in 2007 - 08, they started in a co-ordinated fashion to print money by purchasing assets around the world. The asset purchases by these major global central banks - the US Federal Reserve (US Fed), Bank of Japan (BoJ), European Central Bank (ECB) and the Bank of England (BoE) - have been increasing overtime, though the US Fed has stopped now. My view is that the asset purchases by BoJ and the ECB will not stop. The balance sheet of the major central banks increased 16 times between 1998 and 2015. So why can't it go up another 20 or 100 times? Money printing is an unlimited action, until the system breaks down. By when do you see this system breaking down then? Will this bubble created by central bank liquidity across asset classes burst anytime soon? 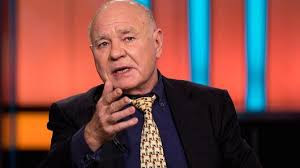 Marc Faber : The bubble can last a long time, one just needs to increase the size of money printing continuously. As a result, asset prices - stocks and real estate - go up phenomenally. So in essence, we have a bull market across asset classes. However, the value of paper money depreciates, as it has done for the last 30 years. Whatever the central banks do now, asset prices will depreciate against precious metals - gold, silver and platinum.